For medical conditions, we say, “an ounce of prevention is worth a pound of cure.” The same goes for anti-aging. We know we cannot stop the aging process; we can however, with correct information and a simple skincare regime, transition gracefully into our 40’s, 50’s, 60’s, and beyond, looking fresh-faced and youthful. In this picture, you’ll see a woman (on the left) who has had little exposure to the sun, in contrast to her twin sister on the right side. What a difference! 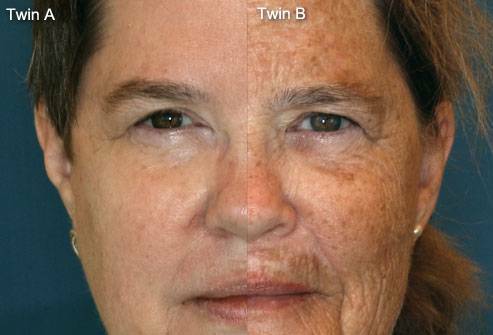 The variable in this twin study was sun exposure. Now, being a big advocate for SPF, I am so excited to share with you some news hot off the press. A clinical study was published June 3rd in the Annals of Internal Medicine which makes the ostentatious claim that “Regular sunscreen use retards skin aging in healthy, middle-aged men and women.” This study is gathering international attention, as it should. Ultraviolet A (UVA) radiation from the sun is thought to be responsible for “photo-aging” and wrinkling of the skin, according to the Skin Cancer Foundation, while ultraviolet B (UVB) rays are the main culprit behind sunburn. Both increase your risk for skin cancers including deadly melanoma. Reality check: 1 in 5 Americans will be diagnosed with skin cancer in their lifetime. According to the American Academy of Dermatology, there are over two-million diagnoses each year in the US alone. 3 out of every 4 of these diagnoses will end in death. Slather up, my beautiful friends! And, not just while you’re in the swimming in the pool! Did you know that sun exposure is cumulative? This means that one year of casual sun exposure (like 30 minutes of daily walking, commuting, etc.) is roughly equivalent to 22 straight 8-hr days of full exposure. Just because you don’t feel the sun, doesn’t mean the harmful UVA/UVB radiation is not wrecking havoc on your precious youthful skin. “The only time you don’t need sunscreen, is when you need a flashlight!” (That’s for FREE, right out of the mouth of Linda Parker this morning!) With this in mind, we should all be slathering on sunscreen as often as we walk outside, and year-round to prevent photo-aging. “Photo-aging” refers to skin changes such as fine lines, wrinkles, mottling and pigmentation of the skin, and skin roughness brought on by chronic exposure to sunlight. These changes are usually associated with chronologic aging (calendar years). However, sun-damaged skin is not a good indicator of actual age. 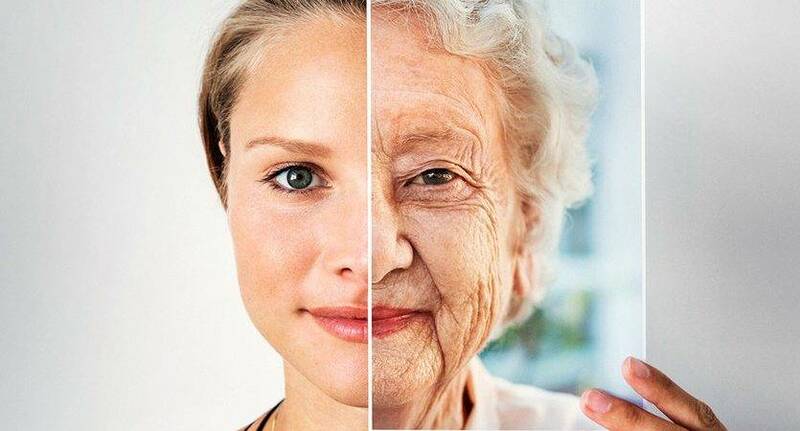 With photo-aging we end up looking much older than we really are. Documented in the New England Journal of Medicine. 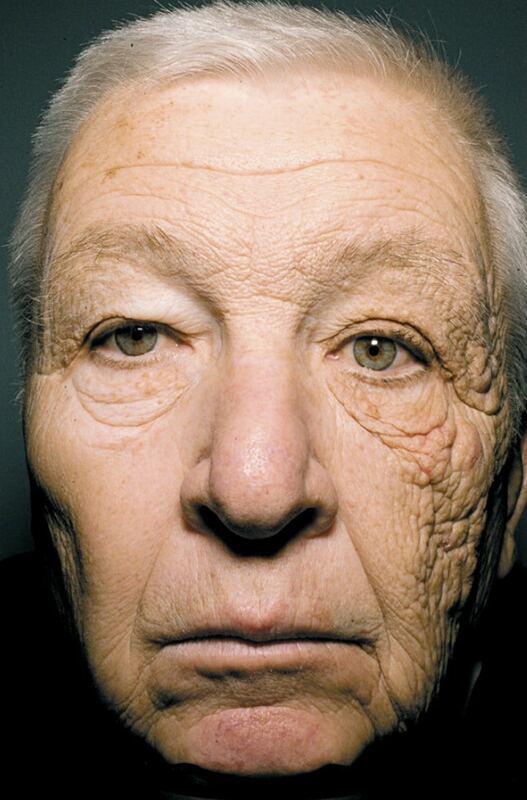 A new striking image of a 69-year-old truck driver shows just how much damage the sun can do. The photo-aging is confined primarily to one side of his face, which is explained by the fact that his sun exposure was had primarily though the truck window during most of his adult life. Sadly, he never wore sunscreen. Documented in the New England Journal of Medicine. I am passionate about sunscreen. You see, in my line of work, I see people with very damaged skin. So many people are dealing with the unflattering effects of photo-aging caused by unprotected exposure to sunlight. The take-away is this: with very little effort, we can ward off this evil villain of aging. SPF products are so inexpensive and easy to get our hands on; we are overlooking what is possibly the #1 youth-preserving product of our time. Don’t forget your hands! Hands are a dead give-away when it comes to age. In fact, many dermatologists will tell you that your hands show age much faster than your face. Ladies, it does NOT have to be this way. So, next time you are watching The View, notice where the celebrities keep their hands. Usually they are out of sight, under the table, or far, far from their face. This is on purpose, because middle-aged women don’t want you to see their hands. Many women spend bookoos of money to keep a young face, but they don’t put effort into their hands. Showing their age? Angelina Jolie (left) and Madonna have the tell-tale thin and wrinkly hands of much older women. Personally, I look at my hands as an extension of my face. Everything that goes on my face… well, it also goes on my hands. So, when it comes to sunscreen, slather up every part of your body that will be exposed to the sun – including your hands. So, this is what I use. 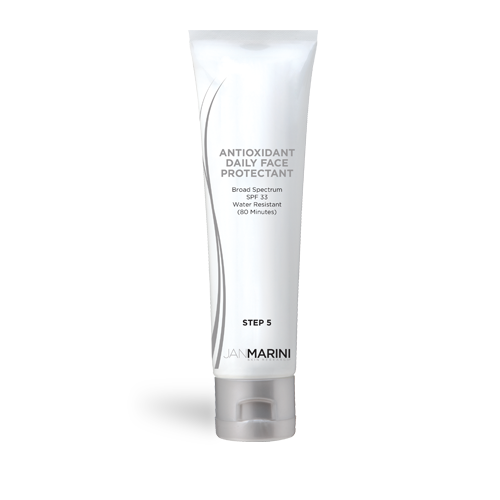 Jan Marini’s Antioxidant Daily Face Protectant. This BRILLIANT product (and I cannot re-iterate that adjective enough) is an invisible, hydrating and weightless sunscreen that feels amazing and smells great. It has SPF 33 and is fast absorbing. It’s a sunscreen you’ll love to wear. There is no sticky residue (like many over-the-counter brands), and it provides broad-spectrum UVA and UVB protection to defend against the evil villain: aging. And if that isn’t enough, check this out: this stellar SPF actually creates the perfect base for your foundation. It’s truly something to ‘oohh’ and ‘ahh’ about! For those of you that love to hear about celebrity happenings, I’ve heard Anne Hathaway and Naomi Watts also use Antioxidant Daily Face Protectant SPF by Jan Marini. Khloe Kardashian is also a believer in this stelar product following her skin cancer diagnosis in 2008. Hey, if it’s good enough for the stars, it’s definitely good enough for us! Daily broad-spectrum sunscreen protects us against skin cancer, and now we know that it has the added benefit of helping us maintain youthful, vibrant skin. A quality SPF product should be a non-negotiable in your beauty régime. Let’s transition gracefully into old age because we use sunscreen: the holy grail for maintaining youthful vibrant skin. What are your biggest concerns when it comes to sun exposure? Why? And what are your favorite SPF products? © 2018 Mather Design Group, Inc. | All rights reserved.